Beth P. found this skeeeeeeery Panda-Pannnts in The Wisconsin State Journal! AHHHH!!!! Love the little Japanese Schoolgirl foot stance action. EEEP! That skeered the BEE-JEEZUS out of me! This pic looks weird. It looks like a behbeh red panda in a small panther halloween costume without the headpiece. 'little japanese schoolgirl foot stance'? whatever happened to 'pigeon-toed'? Creepsy the Finger Tarantula doesn't stand a chance against Panda-Pannnts. Run for your very lives! Doin the pee pee dance! He's so fierce and naughty! I love him. And yes, he is a pretty pretty. The Red Pandaaaa! a.k.a. the Lesser Panda. I'm not lesser!!!! I'm da Firefox!!! Is it just me or is his head-to-body ratio just absolutely off? Red Panda, a kinda fox/ bear combo. Aw, I love Red Pandas. They are always sleeping whenever I try to see them at the zoo. Sleeping with their face hidden! I love the 'rawr'ness going on here. JoyJoy, I can just see him doing the peepee dance!!! LOL Thanks for the visual!!! More red pandas please! They're my absolute favorite! So soft and cute! I'm scawed! The scawy, scawy Mr. Pants is going to get meh! It's too ridonkulous!!!! Eh cahn't stawnd et!! Ok, come to papa little furry munchkin! This is what you see right before Pan-Pants drops for a headbutt--WHAMMO! right in your face. Well, thanks a lot, Meg. Now I'm gonna have nightmares. Panda ballet...little black leotard optional! He's all "Don't MAKE me go Frankenstein on your azz!" He is ADORABLE! I want one, if he won't claw my eyes out!! Jimi Hendrix Panda sings "Fire-Foxy Lady." He can come get me anytime!!! So sweet! Seriously. This little guy can reign over me anytime. that totally looks like the firefox fox ;) :) Or at least a bebe one! omg, he hasn't grown into his big panda head. how does it stay on? he can approach me with sinister intent any day! Love dem red pandas. I once saw a photo of a newborn one. If I could only find it again, it would be on here for sure. "Everybody was Kung Fu fighting! Those cats where fast as lightning!" But why call it red panda? Becky and Shimura's Zoo FTW!!! Adorable little ball of fur as well. Confusedbritt becasue it is a red panda. It isn't a fox. The Red Panda (aka Lesser Panda) is named so because it was thought to be related to the Great Panda. It lives in trees and its diet consists primarily of bamboo (and other vegetation) and has the same extended wrist bone that great pandas have to allow them to grip the bamboo as they eat it. The similarites listed above probably led to its name even though they really look completely different. How did you manage to find the ONE red panda that is actually not cute? A shame. nobody mentioned his wheeskeers? Lookit! He's gonna chomp ya! RAAR! to help in poor Rocky's revival." OMG me wants me WANTS!!! 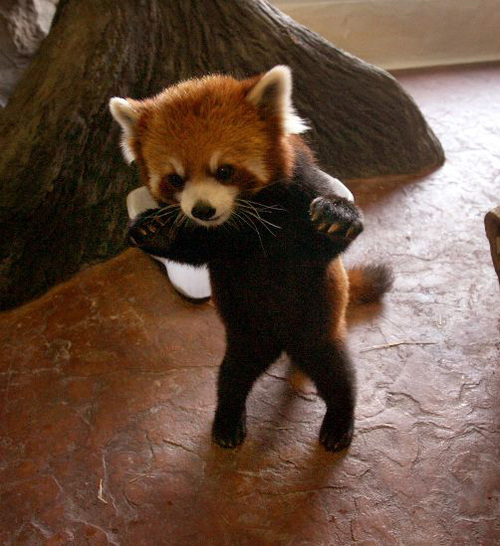 How freaking adorable are Red Pandas... GAH.. I'm choking on the cuteness! Eeenteresting that he is a full grown male, because he looks so cute and baby-ish.